This post about how to teach reading while shopping contains affiliate links. Shopping of course is a great way to get out and spend the day, but did you can also use it to teach reading to your kids? Shopping is great for more than just buying the items you need for your home, it is also a great way to provide much needed literacy skills to your child essential for life long learning. If you have the chance to take your child on your next shopping trip, you should know all of the ways you can use that trip as an educational experience. Below, you will find 5 ways to use your shopping experience to teach reading! How to teach reading while shopping with your child can be so fun, it won’t even feel to them like something educational. Take a look at how easy it is. First, you will want to plan your shopping trip. A great idea to get you started would be to plan a grocery shopping trip. To do this, pull out your sale ads. 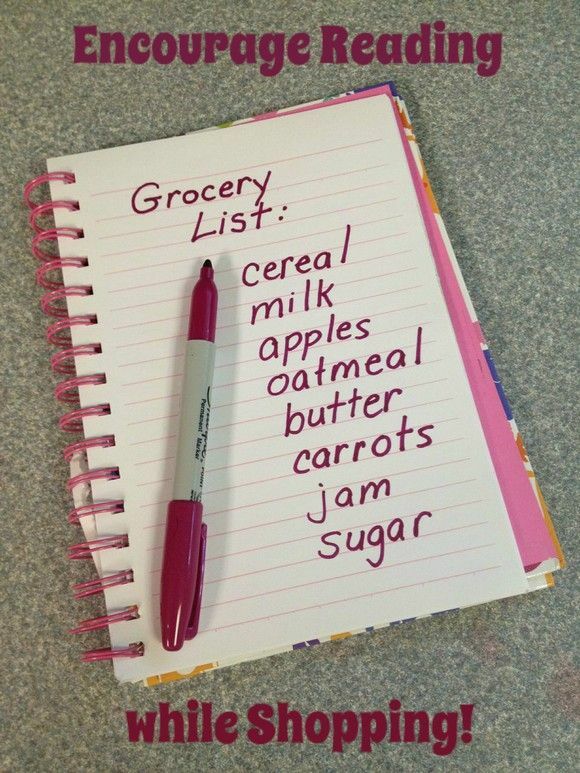 Allow your child to make a shopping list of the items you will be needing. They can cut the pictures out of the sale ad and glue them to paper if they wish. Then, they can write or copy the name of the items next to the picture. Yes, this takes time, but it is a great way to encourage the skills. Now that you have your list, choose the store you wish to shop at. Look at the names of each store as well as the logos. Ask your child to identify them and read their names out loud. You can even look up the address and have your child read the street name and city the store is in. Drive to the store! Read street names and billboards as you come across them. Talk about why reading stop signs, traffic signs, and other signs while driving is so vital. Once you arrive at the store, pull out your list and grab a cart. Show your child the aisle signs that help you see where each food item is at. Read those signs together as well as the price tags and special sale signs. Why is it important to know how to read these? As you put items in your cart, read the labels on the boxes and bags. Pay attention to how various flavors are listed on the box as well as other important information that is essential to know before purchasing. When it comes time to pay, you and your child can look over the receipt and even read it together. As you exit the store, note the other areas of the store where reading is important. Example would be the restrooms so you knew which to go in to, the cart return area, and even the parking lot. On your drive home or even as you put your groceries away, keep talking about why reading is so important in daily life. What would your shopping trip have been like if you didn’t know how to read? How would it have been different? Talk about these things together. Who knew that a simple shopping trip could be such a great way to teach reading skills as well as the value of knowing how to read? You can also try this technique when shopping for clothes or even household basics. The next time you need to head to the store, remember these tips and give them a try. They are a fun and easy way to get your shopping done while teaching these valuable skills at the same time. Looking for more great ways to teach reading to your kids? Check out our post on how TV actually encourages reading! You may be surprised! Do you have any great ideas on other ways to use daily tasks to teach reading to kids? We’d love to hear them! How fun! It could be a great way to distract kids/keep them busy while in the store so they don’t act out, too. My kids love to help with groceries. Serenity love to use the calculator and add it all up as we go. what a great way to keep the kids involved even while you shop, and they’re learning at the same time! Love it! I wholeheartedly agree and support this method! This is the way I tried to raise my kids…I always felt like I was teaching them without them knowing they were learning, and I loved that. When I got my degree in Early CHildhood Education eons ago, this method (of teaching during everyday activities, especially for young kids) was what they pushed, and I’ve kept that in the back of my mind ever since.